The Recarta Windows & SQL Modernisation assessment is designed to provide your organisation with insights into your current Windows and SQL estate. It focuses on key risks and vulnerabilities related to end of support, estate optimisation and modernisation options – resulting in a best-practice plan on how to deliver. 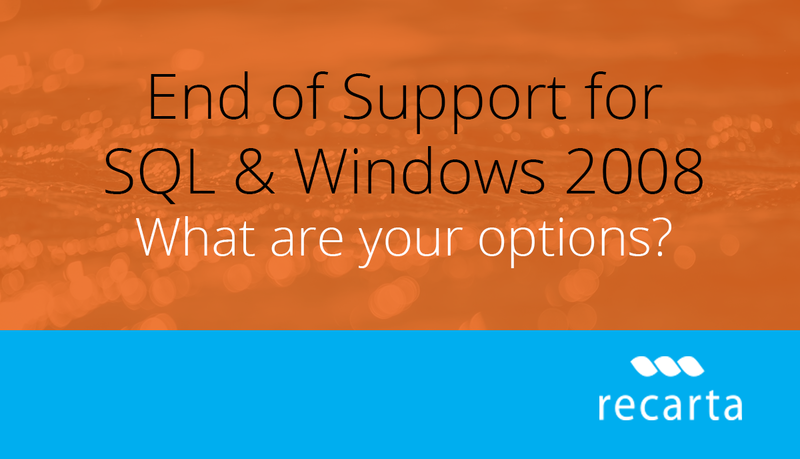 Extended Support for Windows 2008 and SQL 2008 is ending soon! Firstly, decide if you are going to follow an on premise or cloud based route. If your preference is to remain on premise you’r options will be limited to upgrade to SQL Server 2017 (and Windows Server 2016). If you’re open to the idea of cloud environments then Azure offers a number of options to explore. Gain visibility of all Windows and SQL installations across your estate. Recognise the scale of the end of support risks. Understand application and infrastructure interdependencies pertinent to any modernisation activities. Develop technical options to address your Windows and SQL vulnerabilities and modernisation plans. Build commercial options to underpin technical remediation and future roadmap plans. If you would like to discuss your support options, please contact us and a qualified member of our team will be in touch.